Acne is caused by several complex triggers beneath the skin’s surface. One primary trigger that initiates acne is excess oil production. An overabundance of oil begins to clog pores, which eventually causes a blemish. Pantothen is an oral treatment that attacks acne by addressing the acne-causing problem of excess oil. Rather than barely cracking the surface, Pantothen digs deep and targets acne at it’s source–far beneath the surface of the skin. Can Pantothen work for you? Pantothen uses the body’s chemistry to its advantage. Pantothen works by increasing the amount of coenzyme-A in your body to destroy the oil that causes acne to form. It also includes an ingredient that is supposed to help draw the oil to the coenzyme-A molecules and help them destroy the oil more efficiently. One of the main sellin gpoints for Pantothen is that it is an all-natural treatment. Many times natural products are gentler on the body but that doesn’t necesssarily mean they are entirely safe to use. Furthermore, not every natural product is going to be effective. The Pantothen formula combines quality ingredients such as biotin, niacin, thiamin, riboflavin, vitamin B6, folate, vitamin B12, pantothenic acid, and l-carnitine to eliminate excess oil. 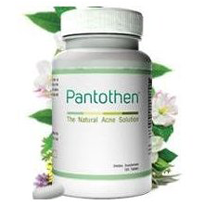 Pantothen uses pantothenic acid to increase coenzyme A, which breaks down oil to prevent acne from forming. Pantothenic acid is best utilized alongside l-carnitine, which circulates coenzyme A for ultimate oil break down. Pantothenic acid was studied mainly by Dr. Lit-Hung Leung in the late 1990’s and he found that it is effective in reducing acne. Since then there have been no studies refuting his findings. Again, just because Pantothen is natural does not necessarily mean it is completely safe. However, since Pantothen is mostly a multi vitamin with the special task to clear yoru skin, you should be able to use it without too much worry. Ultimately, acne is stopped before it even begins with the use of Pantothen. For the most part Pantothen has no known side effects and typically shows results within one to two weeks after using it. After a full month of using Pantothen, you should have a clear complexion. Pantothen tries to promise acne-free skin forever, but such a claim is near impossible. Additionally, we read hundreds of negative consumer reviews, which varied from complaints about the product to complaints about problems with Pantothen’s 90-day money-back guarantee. Although Pantothen sounds promising, we would recommend that you look for a product that has better feedback from consumers. DONT BUY THIS PRODUCT!!!! AWFUL SERVICE!!!! I HATE THIS PEOPLE BEHIND THIS PRODUCT!!! SHAME ON YOURSELF!!! 1) Your roller shluod be replaced on average every 3 months. Therefore it is impossible to get results with a roller that is past its life expectancy. 2) Diet can play a significant role in how successful your results are. 3) We offer full customer support to help people achieve the results they are looking for. 4) If you don’t take before and after pictures, you can’t notice subtle daily change. I purchased this product last APRIL 2012, but i find myself having a hard time to used because the the tablet is really big so I decided to return the product sO I sent to their returning department. So, now I asked for the refund. And they replied to me that my refund was been processed last JUNE 28,2012 but now is END of AUGUST BUT still I havent recieve my refund.. So, ACNE PEOPLE BECAREFUL TO PURCHASED THEIR PRODUCT BCOZ THEY WILL JUST GET YOUR MONEY AND THEIR COSTUMER SERVICE TEAM IS VERY SLOW AND AWFUL!!!! I HATE THIS PRODUCT THIS IS MY FIRST ONLYN SHOPPING THAT DIDNT GO THROUGH!!!!! TERRIBLE PRODUCT!! !